Of the more than 200 LAPD officers who have died in the line of duty, only one was killed while fighting a fire -- Officer Ormiel E. Barney. Barney was born on June 17, 1879, in Trenton, Michigan, south of Detroit, the second of four children born to George Wendell and Ida McFarland Barney, both natives of Ohio. Barney's father worked for the railroad, and the family moved fairly regularly. Shortly after Barney was born, the family moved back to Ohio, then to Nebraska, before finally settling in Southern California in the 1890s. By 1900, the family was living in San Bernardino, where Barney worked as a machinist, and his father was a railroad conductor. The family next moved to La Ballona Township -- now part of the city of Santa Monica. A few years later, Barney married to Mana Louise Thorne, and he joined his father as a railroad employee, working as a brakeman. The couple lived on North Grand Avenue in Los Angeles, near the current site of the Walt Disney Concert Hall. On July 5, 1910, just after his 31st birthday, Barney joined the Los Angeles Police Department, but poor health forced him to quit in 1915. Barney and his wife moved to Arizona, where Barney's health improved, and the couple returned to Los Angeles in 1917. Barney re-joined the LAPD in October 1917, and was assigned to the Westgate neighborhood (now part of Pacific Palisades and Brentwood), near the Sawtelle Veterans Home. On Wednesday, Nov. 21, 1917, a brush fire broke out in Sawtelle, just north of the Los Angeles National Cemetery, and Barney was among those who responded to fight the blaze. The next day, after the fire was extinguished, Barney's body was discovered. Working alone in the thick brush, he had been overcome by smoke and flames. Barney was 38 years old. 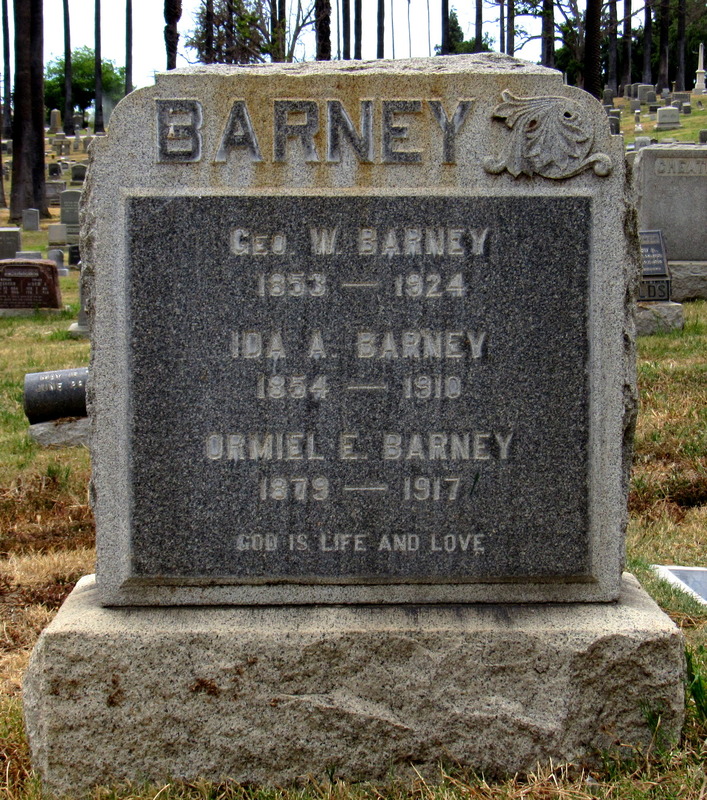 Barney was buried at Angelus-Rosedale Cemetery, next to his mother, Ida, who died in 1910. They were later joined by Barney's father, George, who died in 1924; Barney's younger brother, Frank, who died in 1962 at the age of 77; and Frank's wife, Delia, who died in 1967. Barney's sign is located on the northwest corner of Wilshire Boulevard and Veteran Avenue, just outside the fence surrounding the Los Angeles National Cemetery.